We have some early in-testing changes going out to PTS this afternoon - as always, none of these are necessarily final and they're being evaluated and tested on PTS which means things may change before they go live! * Good news, level 25-39s! Nimble mounts (90% speed increase) no longer require you to wait until level 40 to purchase them. They're now available for 25 platinum at level 25. * Item tooltips now show the stat impact comparison to the item you have equipped. * Fixed an edge case where a player with unspent Soul Points in a role not currently active would be kicked from the LFG queue when using a Porticulum. * More wedding presents for everyone! The Gifted buff now lasts for 1 hour instead of 2. * Added an error message when sending a wedding invitation to a guest who is already attending the wedding. * A new Ascended Power, Fury of the Ascended, has been created as a replacement for Anti-Planar Augmentation/Holy Champion that is available at all levels. This new ability is granted at level 1, and shares a 1-minute cooldown with Anti-Planar Augmentation/Holy Champion (if you have one of these). 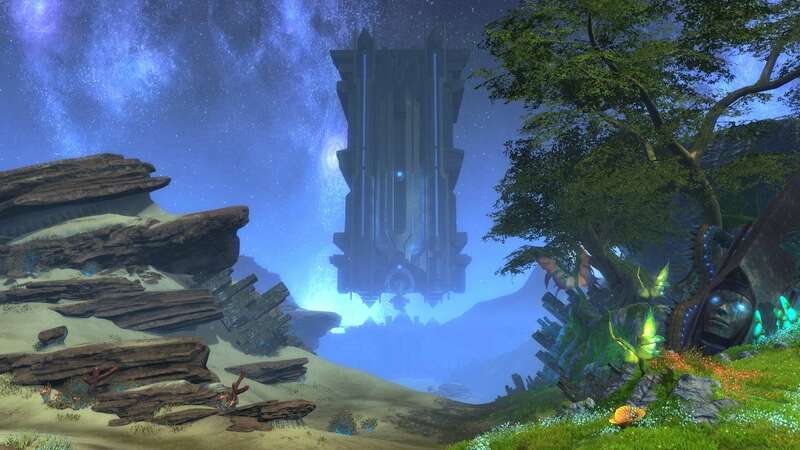 * Anti-Planar Augmentation and Holy Champion are no longer available to be trained from merchants, though characters who already have one of these abilities will not lose them. Fury of the Ascended is meant to replace these Ascended Powers and allow players to become more familiar with how it works at earlier levels. * You can now interrupt ground-targeted channeled ability casts by re-casting the same ability (ex: Fire Storm). * Justicar NPCs will no longer use Sovereignty. * Shield of Oak: Now absorbs all damage types. Increases movement speed by 5% while active. * Wild Strike: Now hits 5 targets. * Spirit of the Wood: Can now also trigger from Wild Strike. * Stone Burst: Ability Removed. * Fae Step: New ability available at 20 points. Teleports you directly to the target. 20 meter range, 15 second cooldown, no global cooldown. * Rage of the Fae: Reduced cooldown to 2 minutes. * Brutal Impact: Now increases the damage of Fervent Strike and Combined Effort by 3-9%. * Hot-Blooded: Now increases the Spell Power bonus of Bombard and Eruption of Life by 5-25%. No longer requires you to spent points in Rage of the Fae to obtain. * Slothful Spirit: The debuff now increases the target's casting costs by 50%. * Stalwart Citadel: Now adds 33-100% of your Wisdom value to Block. * Devout Deflection: Now adds 33-100% of your Wisdom to Parry, and 33-100% of your Intelligence to Dodge. * Sovereignty: Now deals Life damage and stuns the target for 2 seconds. * Supremacy: Now reduces Physical damage taken by 9-18%. * Thorvin's Law: Now reduces non-Physical damage taken by 2-4% plus an additional 1.2% per point spent in Justicar over 26. * Shield of Faith: Now reduces damage taken by 3-15%. * Mien of Leadership: Replaced the Endurance bonus with a 60% maximum health bonus. * Rite of the Ancestors: Can no longer be cast on a target currently under the effect of Spiritual Conflagration. * Ward of the Ancestors, Gathering of the Ancestors: Can no longer be cast on a target currently under the effects of Spiritual Conflagration or Rite of the Ancestors. * Empowering Light: Now only selects targets that have a Poison, Disease, or Curse on them. * Overflow: Now heals for less in PvP situations. * Searing Vitality: Reduced duration to 8 seconds. * Leeching Flames: Reduced duration to 8 seconds. * Consuming Flames: Can no longer be cast on a target under the effect of Purifier's Rite of the Ancestors or Spiritual Conflagration. * Cleansing Flames: Now removes one Poison, Disease, or Curse from up to 10 party or raid members in the target area. Only chooses targets that have an effect to remove. * Withering Vine: Increased duration to 16 seconds. * Natural Conversion: Fixed a case where this could be consumed by an existing damage over time effect instead of on the next damaging spell cast. * Haunting Pain: Increased duration to 16 seconds. * Degeneration: Fixed an issue where this would not purge the target if they were immune to damage. * Charged Shield: Will no longer remove your Mage Armor buff if cast on an ally. * Ignite: Reduced duration to 8 seconds. * Icy Carapace: Increased duration to 16 seconds. * Corpse Explosion: Increased duration to 30 seconds. * Necrosis: Reduced base duration to 10 seconds. Spending points in Flesh Rot now increases the duration of Necrosis by 2-6 seconds, increases base damage by 20-60%, and increases the benefit to Necrosis from Spell Power by 20-60%. * Last Gasp: Should no longer trigger damage shields when refreshed on target being healed. * Fixed some spells granting Charge while Storm Guard is active. * Life Leech: Reduced base duration to 10 seconds. Spending points in Improved Life Leech now increases the duration of Life Leech by 2-6 seconds, increases its base damage by 20-60%, increases the benefit to Life Leech from Spell Power by 20-60%, and increases the amount healed by 10-30%. * Empowered Darkness: Now costs 75 Charge to cast, but no longer consumes Charge or blocks Charge gain while active. Reduced the damage bonus for the Warlock to 70% while Empowered Darkness is active. 15 second maximum duration. * Sacrifice Life: Damage: Reduced cooldown to 30 seconds and increased the damage bonus granted to 20%. * Defile: Fixed Defile continuing to consume Charge if it was cleansed from the target. * False Blade: Functionality changed - now a Finisher that heals the Rogue over 12 seconds. * Improved False Blade: Functionality changed - increases the amount healed from False Blade by 25-50%. * Deadly Dance: The damage bonus from Deadly Dance now only applies to Combo Point-generating attacks that use melee weapons. No longer applied to Saboteur Charges or ranged weapon Combo Point generators. * Vampiric Munitions: The amount of healing siphoned has been reduced from 50% to 40%. Healing reduction remains at 50%. * Fell Blades: The amount of healing siphoned has been reduced from 50% to 40%. Healing reduction remains at 50%. * Dusk to Dawn: Fixed a bug where the Nightrage buff would not be applied if the first tick of Dusk to Dawn killed the target. * Shadow Fire: Fixed the Shadow Fire buff not applying if the target is killed or immune to damage on hit. * Improved Guardian Phase: Now also reduces damage taken from Physical attacks by 5% and non-Physical attacks by 7%. The goal of Saboteur changes in 1.8 is to make the Saboteur a competitive AOE DPS soul, in line with other AOE DPS souls like the Cabalist and Stormcaller. * All Saboteur Charges can no longer be parried, dodged, blocked, or deflected. * Combat Survival: Ability removed. * Combined Arms: New ability. Your Fragmentation Bomb has a 50-100% chance to detonate all Blast and Spike Charges you have applied to your enemies. * Charge Booster: Functionality changed - now increases the Attack Power contribution to damage of Charges by 10%. For every point spent in Saboteur above 21, the Attack Power contribution is increased by 3%. * The Trapper: Ability removed. * Trench Warfare: New ability. Increases the Attack Power contribution to the damage of all Bombs, Traps, and Land Mines by 10%. For every point spent in Saboteur above 26, the Attack Power contribution is increased by 4%. * Demolition Specialist: Now affects an additional 2-4 targets, up from 1-2. * Caltrop Charge: Functionality changed - Now causes the target and surrounding enemies to Bleed for 15 seconds when detonated. * Splinter Charge: Now deals damage and applies its debuff to the target and surrounding enemies. * Embers Charge: Now deals damage and applies its debuff to the target and surrounding enemies. * High Explosives: Functionality changed - your Fragmentation Bomb, Time Bomb, and Annihilation Bomb now cause the target and surrounding enemies to Bleed for 6 seconds. * All Traps, except Land Mines, no longer have a cooldown. * Zardonis' Saboteur Crystal: 2-Piece Bonus: Functionality changed - now increases the damage of Blast Charge and Spike Charge by 30%. * Zardonis' Saboteur Crystal: 4-Piece Bonus: Functionality changed - now increases the damage of all Saboteur AOE abilities by 15%. * All Warriors now get a passive buff called Building Fury, which gives increased Attack Power contribution to Finishers based on the number of Action Points used. * Finishers no longer have their own individual damage increases based on Attack Points. * All damaging abilities have been rebalanced to work with Attack Power being used in a more consistent manner. * Slashing Strike: Fixed the delay before the ability deals its initial damage. * Deadly Strikes: Fixed a bug allowing Deadly Strikes to work with one-handed weapons in certain cases. * Cornered Beast: Now has a 2.5 second duration, dealing damage every 0.5 seconds. Cooldown reduced to 30 seconds. * Titan's Strike: Cooldown reduced to 30 seconds from 1 minute. * Destroyer's Bearing: Damage bonus increased to a maximum of 50%, up from 35%, and now always generates an Attack Point. * Disruptive Strike: Cooldown lowered to 10 seconds from 15. * Bloodthirst now gains a 200% Attack Power contribution instead of a weapon damage modification. * Distruptive Strike: Now gains a 200% Attack Power contribution instead of a weapon damage modification. * Weapon Specialization: Increased to 0.6% ability damage increase per point spent in Champion. * Rasmolov's Champion Crystal: The 4-piece bonus damage for area of effect attacks has been reduced from 35% to 20%. * Rising Waterfall: Now has different damage effects based on whether you're Dual Wielding or not. * Rising Waterfall: Now gains a 200% Attack Power contribution instead of a weapon damage modification. * Flurry: Duration reduced to 2.5 seconds, dealing damage every 0.5 seconds. Cooldown reduced to 30 seconds. * Teaching of the Five Rings: Increased to 0.6% ability damage increase per point spent in Paragon. * Way of the Mountain: Now only enhances the damage of follow-up attacks when dual wielding. * Paired Strike, Path of the Hurricane, Path of the Raptor, Death Touch: Now gain a 200% Attack Power contribution instead of a weapon damage modification. * Static Shock: Now deals damage based on your Attack Power. * Storm Blade: Now deals damage based on your Attack Power. * Rift Fury: Now affects all attacks, similar to Teaching of the Five Rings or Weapon Specialization. Increased to 0.6% non-physical ability damage increase per point spent in Riftblade. * Rift Strike: Now gains a 200% Attack Power contribution instead of a weapon damage modification. * Damage of all Burst abilities has been rebalanced; they've been reduced to reflect that they are off the global cooldown. * Rift Shield: Can no longer be cast on a target under the effect of Purifier's Rite of the Ancestors or Spiritual Conflagration. * All player debuffs have been assigned priorities within their stacking groups. Less powerful debuffs should no longer overwrite the more powerful ones. * Note: The below grouping list does not indicate that the higher listed debuff overwites lower listed ones; the strongest (in terms of amount of stat debuffed) cast on a target from within a stacking group will overwrite weaker value debuffs within the same group. If equal, they will overwrite each other. * Cleric: War: Mark of Purification: Functionality changed. Now, your single-target cleanses have a 5-25% chance to remove an additional Curse, Disease, or Poison effect. * Cleric: War: Blessing of the Martyr: Functionality changed. Your attacks have a 15-30% chance to make enemy players vulnerable, increasing their damage taken by 1% for 10 seconds. Stacks up to 5 times. * Mage: War: Rift Tomb: Fixed an issue where Rift Tomb could be parried, dodged, or miss. * Rogue: War: Expedited Wounds: Functionality changed. Reduces damage taken from Critical Hit attacks by 1-5%. We'll be testing a new version of Whitefall on PTS for a few weeks - Whitefall Steppes: Avalanche! * Whitefall Steppes: Avalanche: Carriers can no longer use teleport abilities. * Whitefall Steppes: Avalanche: Carriers no longer gain the benefit of movement speed-increasing abilities. * Belts are now included in set bonus groups for the PvP Armor sets. * Death's Approach, Scaldwater Fields, and Firesand Desert have been split into smaller adventure locations to better define adventure objective areas. * The Raid Rift tear in Fort Zarnost no longer blocks attackable objects for PvP Rifts. *Updated quest flow and population around Howling Caves and Cloudborne Caverns. * Divine Work, Divine Rewards: Increased the power of the Blade of Light reward to better match the other rewards from this quest. * Zone events in Scarlet Gorge and Scarwood Reach should have a longer start-up time after the initial announcements. * All Expert and Master mode dungeons now drop Corrupted Souls from the final boss. * All Standard-mode dungeons and Chronicles now drop Malformed Souls from the final boss. * Transplanar Synergy Crystals can now be equipped at level 42, to match the equipment levels of the first Transplanar set items. * The 4-piece set bonus for Stalwart's Battlegear now correctly deals Death-type damage. * The 4-piece set bonus for Deathbringer's Battlegear now correctly deals Air-type damage. * Fixed the misspelling of Abyssal Signet. * Exalted Healing Tonic has its tooltip updated to reflect the actual amount healed. * Philter of Power now has a stacking priority and should no longer be overwritten by a weaker buff. * All Planar Essences should now be able to be Salvaged or Runebroken appropriately. * The recipe for Conditioned Leather Jerkin has been adjusted to require more Steeled Leather and less Cinerium Bars. * Weaponsmithing: Runeguard Blunderbuss now properly requires the Forge instead of a Workbench. * Recipes for Implacable Steel Gloves, Lightsmasher, Malevolent Greataxe, and Spark Smiter have their material requirements adjusted to be in line with other similar recipes. * Harvestable mobs from levels 40-44 now grant Titanium when mined. * The 'Usable Only' checkbox on the Auction House now filters crafting recipes that you've already learned. * Item tooltips also now update properly when you have the tooltip showing when you right-click to equip an item. * Widened the ability mouseover and Soul Tree tooltips to get more room for text. * The Achievement score displayed on the Guild Roster should now always match the total displayed on a character's Achievements window. * Canceling or creating an auction now preserves your scroll position on the Auctions window. * You can now use the command '/combatlog 1' and '/combatlog 0' to explicitly turn combat logging on or off (it previously would toggle the current setting). * Added a /stuck command that brings up the existing Customer Service stuck window to allow you to teleport back to a graveyard. * Pillaging Stone: The ability description will now correctly update the stats given by this buff as you spend points in Strength of Stone. * Rising Waterfall: Increased the damage for non-dual-wielding to match that of Power Strike. * Avatar of the Rift: Lowered damage dealt. * Burning Blood: Now bases damage off of your Attack Power. * Enhanced Burst: Now applies an increased 10-30% damage boost to Searing Strike, Frost Strike, Thunder Strike, and Rift Strike for 6 seconds after using a Burst. * Fiery Burst: Now has a 10 second duration. * Rift Storm: Has been changed to more closely match Cornered Beast and Flurry. Lasts 2.5 seconds and hits every 0.5 seconds. * Forked Lightning: Increased max number of targets this can hit to 8. Moi ce que je constate, c'est qu'il n'y a visiblement pas d'ajout roleplay de prévu. Ce n'est pas une patchnote de contenu, c'est une patchnote de modifications, dont la plupart sont réclamées depuis longtemps par la communauté. Le prochain raid 20 est en test actuellement et normalement prévu pour la 1.8, il n'est pas indiqué dans cette note. Au temps pour moi alors. On verra bien ce qu'il en est au final. Que du bonheur ! Enfin trion se penche sur l'anathema et ils montrent qu'ils ont écouté les plaintes des mages T4 suite à la 1.7. Quel joie d'apprendre qu'après 1 ans de jeu Trion règle le problème des clerc tank. Plus besoin de force maintenant c'est full sagesse !!!!!!!! Zut je viens de me rappeler que je viens juste de finir de refaire mon focus Tank avec des essences de force. Possédant un alt clerc tank, je ne peux qu'être d'accord avec toi, les modifs blocages, parade esquive après quelques rapides calculs nous mettent au même niveau que les wawas. Le bon côté des choses c'est qu'il y aura plus de variété dans les possibilités proposées aux guerriers. La cascade ascendante à la 2M c'est poubelle ! Il était temps. Le guerrier subit du lourds changements au jour le jour, la plupart des classes voient leurs âmes tombées en désuétude revue à la hausse et/ou au changement.